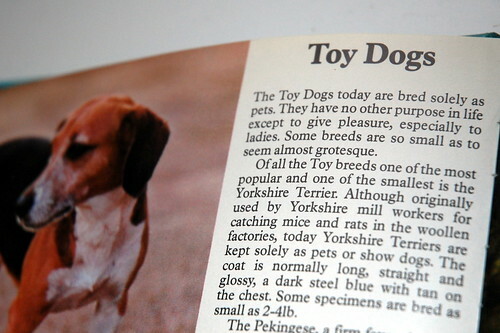 The Toy Dogs today are bred solely as pets. They have no other purpose in life except to give pleasure, especially to ladies. Also, I’ll be attending GUADEC for the first time this year, and I’m looking forward to a good time in Istanbul and finally meeting a lot of people in person that I’ve known online for a while. WebKit work is going quite well. I’ve mostly been focusing on bug fixing so far, though I’ve added some new features as well (CSS text shadows are now supported in the Qt port, for instance). Overall I’ve been really impressed with how clean and well-organized WebKit is for such a large and complex project. I’ve also started playing around with ‘webkitmm’ in my spare time as well. Nothing much to show at the moment, I’m afraid, but I don’t expect it to take too much effort before it’s relatively usable.